Սասունի շրջանում քրդական առաջնորդները հարկատու էին դարձրել հայ բնակչությանը։ Միաժամանակ թուրքական կառավարությունը պահանջեց պետական հարկերի պարտքերի մարում, որոնք սահմանվել էին առանց հաշվի առնելու քրդական կողոպուտները։ Հաջորդ տարում քրդերն ու օսմանյան պաշտոնյաները հայերից պահանջեցին հարկերի վճարում, բայց հանդիպեցին դիմադրության, որը ճնշելու համար ուղարկվեց թուրքական Չորրորդ բանակային կորպուսը։ Սկսվեց Սասունի հայ բնակչության կոտորածը, որի արդյունքում սպանվեց ավելի քան 3, 000 մարդ։ Մեծ Բրիտանիայի, Ֆրանսիայի և Ռուսական կայսրության դեսպաններն առաջարկեցին համատեղ հետաքննող հանձնաժողով ստեղծել, բայց առաջարկը մերժվեց Բարձր դռան կողմից: Սասունի իրադարձությունների մասին Էրզրումում Մեծ Բրիտանիայի հյուպատոս Քլիֆորդ Լլոյդն արտգործնախարարություն ուղարկված իր զեկուցագրերից մեկում գրում էր. Թալեաթ փաշայի՝ 1910 թվականի Սալոնիկի վեհաժողովում արած հայտարարությունը. Առաջին աշխարհամարտը հնարավորություն է ընձեռում երիտթուրքերին հաշվեհարդար լինել կայսրության հպատակ հայերի հետ՝ իրականացնելով դեռևս 1911 թվականին Սալոնիկ քաղաքում տեղի ունեցած գաղտնի ժողովի որոշումը։ Այն նախատեսում էր, որ կայսրության տարածքում բնակվող մուսուլմանները պետք է թուրքացվեն, իսկ քրիստոնյաները՝ բնաջնջվեն։ Համագումարում որոշվել էր. Օսմանյան կայսրության ներքին գործերի նախարար Թալեաթը ԱՄՆ դեսպան Մորգենթաուի հետ զրույցում. Ֆրանսիացի հրապարակախոս Ռենե Պինոն գրել է.
Ընդունվեց հայերի բնաջնջման որոշում և հանձնարարվեց կառավարությանը իրականացնել այն։ Կազմվեց այդ հարցով զբաղվող գործադիր կոմիտե (դոկտոր Նազըմ, դոկտոր Բեհաեդդին Շաքիր ու լուսավորության նախարար Միդհաթ Շյուքրի) և լիազորներ կարգվեցին վիլայեթներում։ Հանձնարարվեց հայերին բնաջնջել բոլոր միջոցներով։ Թալեաթի գլխավորությամբ ստեղծվեց հայերի բնաջնջման հատուկ կազմակերպություն՝ «Թեշքիլաթ-ը մահսուսե»՝ լայն ճյուղավորմամբ (50-ական հոգով), և համապատասխան հրահանգներ ուղարկվեցին բոլոր վիլայեթները։ 1915 թվականի փետրվարի 18-ի գաղտնի հրահանգում ասված էր. ԽՄԿԿ Կենտկոմի կենտրոնական օրգան «Պրավդա»-ն 1965 թվականի ապրիլի 24-ին գրեց, որ «հիսուն տարի առաջ երիտթուրքերի կառավարությունը ոչնչացրեց մոտ մեկուկես միլիոն հայերի», և դա կատարվեց իմպերիալիստական Գերմանիայի աջակցությամբ ու հովանավորությամբ։ Ֆրանսիայի կոմկուսի կենտրոնական օրգան «Յումանիտե»-ն նույն թվականի ապրիլի 23-ին նշեց. արժևորելով 1915 թվականին միջազգային հանրության կողմից Անտանտի պետությունների մայիսի 24-ի համատեղ հռչակագրով հայ ժողովրդի դեմ իրականացված ծանրագույն հանցագործությունը պատմության մեջ առաջին անգամ որպես «մարդկության և քաղաքակրթության դեմ իրականացված հանցագործություն» որակումը և օսմանյան իշխանություններին պատասխանատվության կանչելու հանգամանքի շեշտադրումը, ինչպես նաև 1920 թվականի օգոստոսի 10-ի Սևրի հաշտության պայմանագրի և 1920 թվականի նոյեմբերի 22-ի՝ ԱՄՆ-ի Նախագահ Վուդրո Վիլսոնի Իրավարար վճռի դերը և նշանակությունը Հայոց ցեղասպանության հետևանքների հաղթահարման հարցում. The Armenian Genocide Institute-Museum was opened in Yerevan, Armenia, in 1995, as part of the events commemorating the eightieth anniversary of the beginning of the Armenian genocide (1915-1923) at the hands of the Young Turk regime. Indeed, following the shock of the Holocaust, we have become aware of mass destruction that preceded and followed the Second World War. One thinks, for example, of the Armenian genocide of 1915-1923, of the Stalinist Gulag, Burundi, Biafra, Indonesia, Sudan, Ethiopia, and of the Cabodian «autogenocide». When Raphael Lemkin coined the word genocide in 1944 he cited the 1915 annihilation of the Armenians as a seminal example of genocide. Indignant that the perpetrators of the Armenian genocide had largely escaped prosecution, Lemkin, who was a young state prosecutor in Poland, began lobbying in the early 1930s for international law to criminalize the destruction of such groups. ↑ 40,0 40,1 40,2 40,3 40,4 Stephan Astourian The Armenian Genocide: An Interpretation. ↑ Արման Կիրակոսյան Հայկական հարցը և հայերի ցեղասպանությունը (հայերեն, ռուսերեն, անգլերեն). — Էջ 101. — Էջ 12. ↑ Դանիելյան Էդուարդ Հայ ժողովրդի մեծ եղեռնը երիտթուրքական վարչակարգի կողմից (1914-1918 թվականներ) (հայերեն) // «Անլռելի զանգակատուն» մատենաշար. — Էջ 9. ↑ The Letters of Theodore Roosevelt (Cambridge, Mass: Harvard University Press, 1954), p. 6328. Estimates of the total number of Armenians in the empire vary, but a number of around 1, 500, 000, some 10 per cent of the population of Ottoman Anatolia, is probably a reasonable estimate. 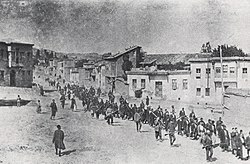 Starting in 1915, one and a half million Armenians (60 % of the population) were eliminated by the Turkish government during the First World War. Dr. Lepsius took considerable care with the figures he used, although perhaps he should have been more circumspect in accepting the figure of 1, 845, 450 given by the Armenian patriarchate in Constantinople as the number of Armenians living in the Ottoman Empire. Nevertheless, it is unlikely to be far wrong, if we accept the figures that Enver Pasha gave to Dr. Ernst Jackh as early as the end of August 1915 for the number of Armenians dead (300, 000) and those quoted by the German Embassy on October 4, 1916. Of the approximately 2 million Armenians living in the empire, 1, 500, 000 had been deported and between 800, 000 and 1, 000, 000 of those had been killed. Lepsius initially estimated the number of Armenians who had died in the empire at 1, 000, 000; in the 1919 edition of the Bericht he revised that figure to 1, 100, 000. 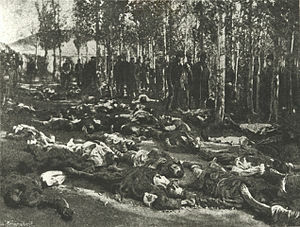 Lepsius put the number of eastern Armenians killed during the Ottoman invasion of Transcaucasia in 1918 at between 50, 000 and 100, 000. Another German closely involved at the time, Ernst Sommer of the Deutscher Hilfsbund, estimated in 1919 that 1, 400, 000 Armenians had been deported, of whom at the time scarcely more than 250, 000 were alive (Sommer, 1919). <…> Lepsius also estimated that the number of Armenians forcibly converted to Islam was between 250, 000 and 300, 000. There was no religious element in the forced conversions to Islam at this time. The Ittihadist rulers of the empire were unbelievers. By contrast, some Turkish Muslim leaders, imams and hodjas, expressed disapproval at what the Armenians were compelled to endure. The harsh measures against the Armenians of Kutahia were declared theologically invalid by the local mufti Forced conversion had instead a political motive: to destroy the Armenians' identity, to turn Armenians into «Turks» so that they would appear in the other column of statistics and thus weaken or nullify any Armenian demands for autonomy or independence. Some Armenians appear to have returned to their faith after the armistice, but no figures exist for them. Armenian Massacres (Armenian Genocide) The term Armenian Massacres refers to the massive deportation and execution of ethnic Armenians within Ottoman-controlled territories in 1915. <…> This episode started in April 1915 during World War I, after the Ottomans suffered a major defeat at the hands of Russia. The second controversy is over numbers: Turkish historians have put the number of deaths as low as 200, 000, while the Armenians have sometimes claimed ten times as many. <…> Between 600, 000 and 800, 000 deaths seems most likely. Estimates of the Armenians killed in the deportations and massacres of 1915-1916 range from a few hundred thousand to 1, 500, 000. Although the precise circumstances of these events and the total number of dead are hotly contested be the scholars from the opposing political camps, even the most conservative estimates place Armenian losses at approximately half a million. The higher figure given by Armenian scholars is one and a half million dead. ↑ Roger W. Smith. The Armenian Genocide: Memory, Politics, and the Future // Richard G. Hovannisian. The Armenian genocide: history, politics, ethics. Palgrave Macmillan, 1992. ISBN 0-312-04847-5, 9780312048471. Стр. 8. But denial can enter into the very fabric of a society, so that those who come after sustain and even intensify the denial begun by the perpetrators. The most strident and elaborate denial of genocide in history follows this pattern. The Turkish Republic, established in 1923, is not guilty of physical genocide against Armenians, but it continues to the present to deny that the Young Turk government engaged in massive destruction of Armenians from 1915 to 1918, resulting in the death of over one million persons, and the elimination of the Armenian people from its homeland of nearly 3000 years. ↑ Rouben Paul Adalian. Treatment Of The Armenian Genocide In Representative Encyclopedias. // Israel W. Charny, Encyclopedia of genocide էջ 73։ «In all, it is estimated that up to a million and a half Armenians perished at the hands of Ottoman and Turkish military and paramilitary forces and through atrocities intentionally inflicted to eliminate the Armenian demographic presence in Turkey». ↑ Douglas Arthur Howard %20but%20most%20historians%20agree%20it%20was%20around%20800000%20to%201000000%20people.%22&pg=PA83 The history of Turkey, P. 83. The exact number of those who died is a matter of dispute, but most historians agree it was around 800000 to 1000000 people. The turkish government’s position is that only 300000 armenians perished during the «troubles», while most historians place the number somewhere between a million and a million and a half. ↑ Ronald Grigor Suny Dialogue on Genocide. ↑ Rafael de Nogales. Cuatro años bajo la media luna (Madrid: Editora Internacional, 1924). Перевод на немецкий «Vier Jahre unter dem Halbmond: Erinnerungen aus dem Weltkriege» (Berlin: Verlag von Reimar Hobbing, 1925), английский «Four Years Beneath the Crescent» (London: Sterndale Classics, 2003). ↑ Ronald Grigor Suny, Fatma Muge Gocek, Norman M. Naimark, A Question of Genocide. Armenians and Turks at the end of the Ottoman Empire, հ. Preface, էջ XVI։ «That the muhacirs were moved as quickly as they were into Armenian houses and occupied Armenian farmland after the deportations attests to the strength of popular economic ambitions, as well as government policy, in the development of genocide». Although this topic has not yet received systematic analysis, it clearly points to official complicity at a very high level, since mujahirs from Thrace could not reach Cilicia or Turkish Armenia without organization and planning. ↑ The Armenian Genocide Resolution Unanimously Passed By The Association of Genocide Scholars of North America, The Armenian Genocide Resolution was unanimously passed at the Association of Genocide Scholars’ conference in Montreal on June 13, 1997. ↑ Samuel Totten, Paul Robert Bartrop, Steven L. Jacobs (eds.) Dictionary of Genocide. Greenwood Publishing Group, 2008, ISBN 0-313-34642-9, p. 21. ↑ Greece parliament ratifies bill criminalizing Armenian genocide denial. Jurist, 10 September 2014. Stephan Astourian The Armenian Genocide: An Interpretation. Ronald Grigor Suny Dialogue on Genocide. Selim Deringil Mass Conversions of Armenians in Anatolia during the Hamidian Massacres of 1895–1897. Կոտորած Սիրիայում • Բուլղարացիների ջարդեր • Թրակիայի բուլղարացիների բնաջնջում 1913 թ.